It would be nice if Westlife's management could understand the reasons why "Change Your Mind," an original song written by Euro powerhouse team Steve Mac and Wayne Hector, is the best song on Face to Face, and the first clue would be "original" song. It isn't another ballad trying to re-create the glory of "Flying Without Wings," it isn't a trendy pass and go, Backstreet Boys wannabe, of a Michael Jackson wannabe, song like "Hit You with the Real Thing," and it is not, thank heavens, a cover song to add to increasing evidence that they are a karaoke band. It is a surprisingly old-fashioned song, big and brassy, the kind the Four Tops would have sung. 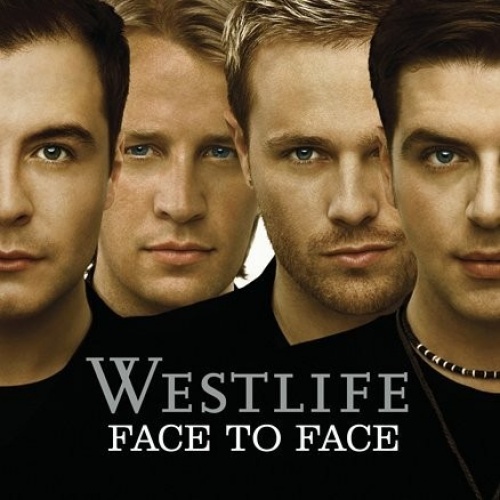 It is important to note that Face to Face is the first real opportunity for the group to move on as a quartet without Brian McFadden, unless you count their album of Frank Sinatra covers. They demonstrate here that they have longevity and can proceed gracefully, but why, oh why, must we be subjected to so many songs we have heard before, without any additional significance given them? Under the direction of Simon Cowell, American Idol winners sing covers of classic songs and become famous in the process. But when they go on to fame beyond American Idol, their higher fame is based on new and original songs. Westlife is a group that, under the production of Cowell, has worked in reverse. Because their fans are so faithful, and eat up anything that is served, Westlife stays in business and prospers, but their empire is being built on music that will not last. In 20 years, when "You Raise Me Up" is played on the radio, will any DJ who is not under the influence choose Westlife's version over Josh Groban's? Their version of "Desperado" is not as good as the Eagles version, but does it offer anything different that makes it required listening? They have done a few covers well in the past, particularly on their wonderful debut album, with "Seasons in the Sun," which gave the impression that this was truly an "Irish" group, and "More Than Words," which was better than the original and had a reworked, lovely bridge. The exception to this major gripe on Face to Face is that Diana Ross lends her classic "When You Tell Me That You Love Me," and lends her vocals, too. It is a near perfect treat, because it is so well mastered, such an angelic song, and because the pairing is unique. The cover of "In This Life" had already been covered by Bette Midler, Kathie Lee Gifford, and Ronan Keating (who helped establish Westlife), and made not a hit for any of them. Bette Midler sang it best, and once was good enough. On a Westlife album, it is typical filler. "Colour My World" is another worthy song on the album, lush with piano, strings, choir, and soul. If they could make an album full of songs as good as it, they would restore all hope for their potential.